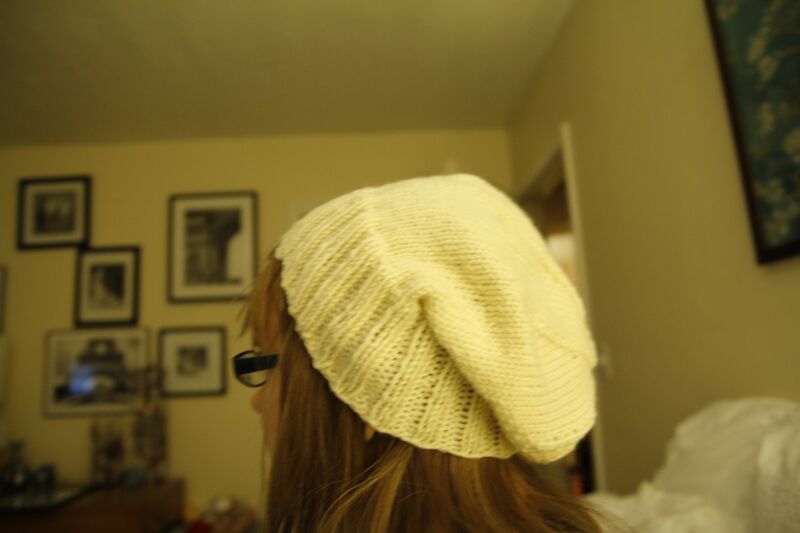 I knit myself another slouch hat, this time in cream so it will go with pretty much anything. Its so easy to knit! I started it last Friday while my dad was undergoing chemo, and didn’t quite have time to finish it that day so I finished it over a sleepless Saturday night. I have wool moths. I don’t think they’re that common in Florida, so I have a feeling they might have come with some wool I ordered from somewhere. I have no idea what to do to control them. I haven’t noticed any yarn damage either, but a moth did fly out of one of my yarn baskets. I should be keeping it in sealed containers. If anyone has any tricks to turn off wool moths, please let me know. I started work last night on this decreasing ribbed caplet. I’m making mine in chocolate brown Valley Yarn Berkshire Bulky. I like the way its knitting up so far. 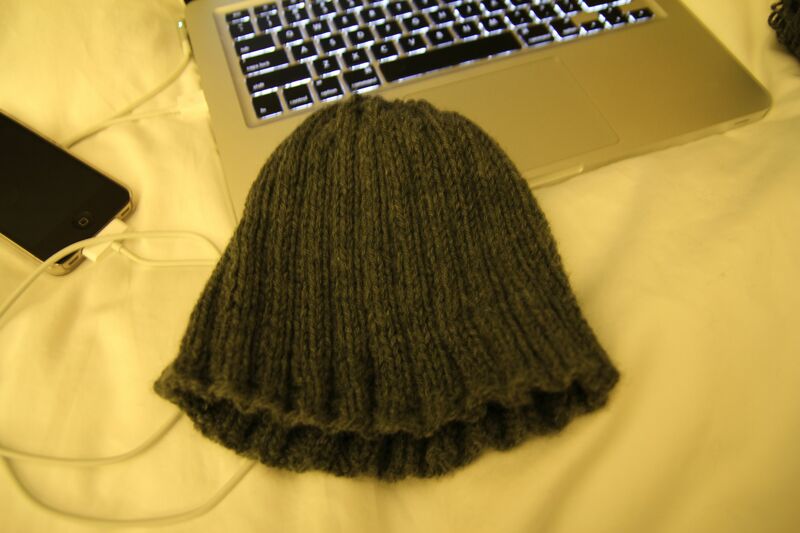 But its a safe project, almost like a hat except you don’t close the top. I want to start other things like shawls and cardigans, but I seem to be lacking the confidence to take them on. Maybe its just the way things are going in my life right now that’s dragging me down. I’m taking on so many big problems and dealing with a lot of stress, maybe I just don’t want a big project on my shoulders right now. How about you? What do you work on when you’re stressed? 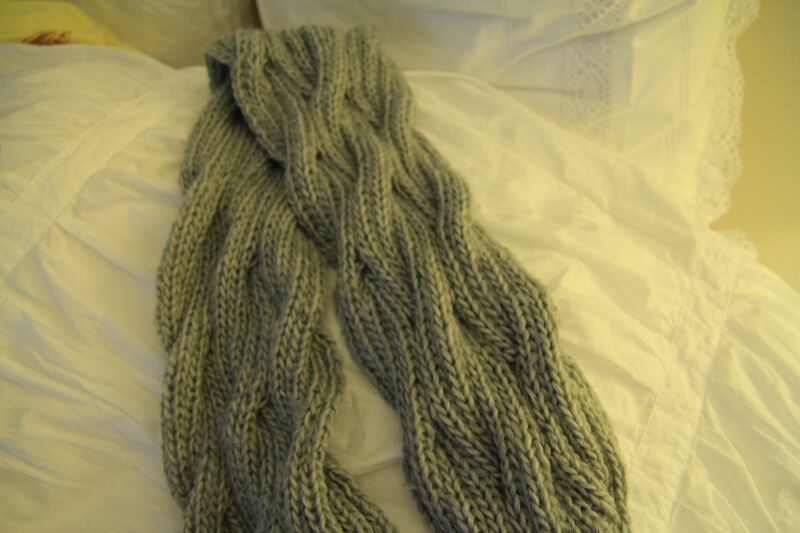 Its long, soft, and cozy. I’m happy with how it turned out, i just didn’t enjoy knitting it as much as I might have because of the yarn. Sure its soft but it would split and break too easily. I added a stash bust counter (sort of) to the side of the page. I don’t know if that’s my correct yarn count, but its what I counted in my ravelry stash. I need to count my actual stash. I went to my LYS yesterday for needles and some extra loops for my interchangeables. I did buy one ball of yarn but I’m planning on using it up right away. I was proud for avoiding temptation. Next project? Hat and mittens! 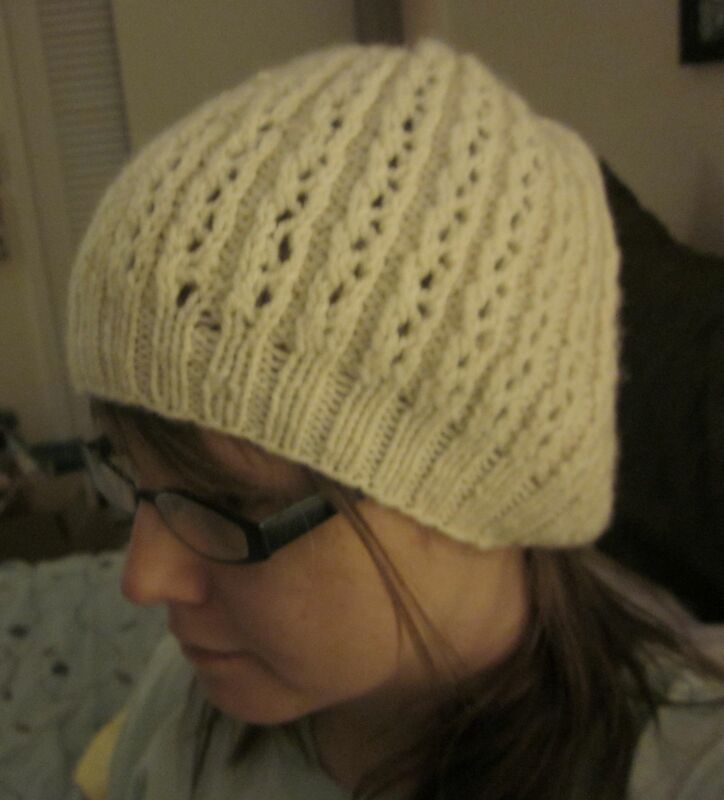 Last night, to take a break from the scarf (the yarn is driving me nuts) I decided to knit a hat. I was looking for a basic slouch hat, which I found in Kendall. Once I got started I just didn’t stop. Perfect tv knitting, sinceI was watching tennis at the time. finished up in a few hours. Its perfectly slouchy and comfy. I used Ella Rae Classic superwash. I want to knit it in every color now! I think I may go against my no new yarn rule and pick up a skein of a nice cream so I have one that goes with everything. As much as I love purple, it won’t go everywhere. It used close to the entire skein, which I believe is 210-220 yards. 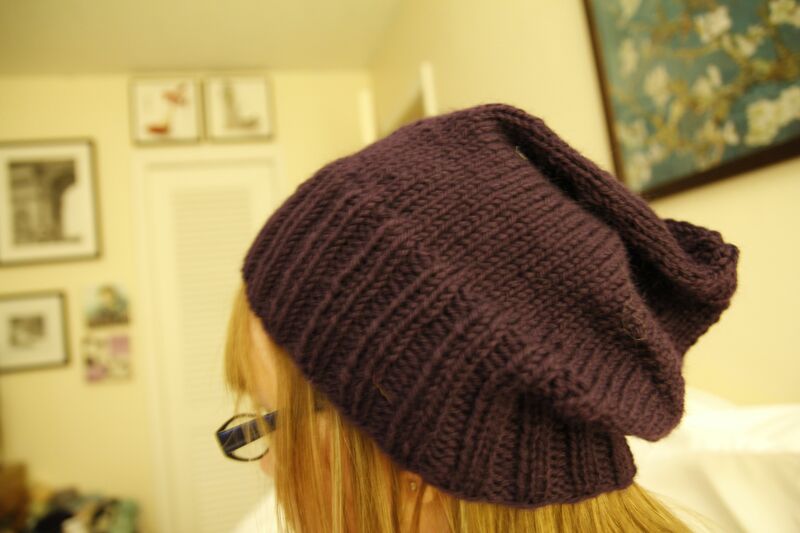 If you happen to be looking for a nice, simple, slouchy hat, this is the way to go. The reason the yarn is driving me crazy on Cinder is because it is so , well, loose. It splits and sheds. Its making a soft, gorgeous product, but sometimes I just want to scream. Its almost done though, about a skein and a half and it will be gone! Six skeins destashed! As for Bella’s mittens, I frogged the one I started, but I’m going to start them over. The only way to get good at knitting something is to practice. I finished the hat for the boy, and it fits his big head. Now hopefully he’ll wear it. Not that it was difficult to knit or anything, I’d just really like it if he wore something I knitted for him. I was trying to decide which mittens I want to knit for my next project. I’m not sure why I settled on mittens. I guess because I haven’t knit any in a long time. I don’t know why its such a hard decision, especially when the patterns (Bella’s mittens or Irish hiking mittens) are really not that similar. I think I’m going to do Bella’s mittens first because the yarn for those has been in my stash longer. That’s what I really need to plan my projects around-stash busting. I can use up some Malabrigo in March, and knit one of the cardigans next month. I’ll just keep plowing through the list and stop looking at new patterns. Then I won’t be so tempted to buy yarn. I’ve done this before though-putting myself on a yarn diet. Goes about as well as regular diets. Still, I’m having trouble finding motivation to knit. Maybe its because I’ve got a cold and just don’t feel great, but I haven’t been revved up to start anything lately. Its winter! This should be peak knitting time, but its not. This time last year I was working on my first cardigan, I think. I started it sometime in January. Now I’m doing nothing. I’m sure it will get to me soon.